One Swedish teenager, 16 year old Greta Thunberg, captured the imagination of the world with her resolute determination to demand urgent action on climate. Greta herself has become a celebrity climate activist. She has given a Tedx Talk, she was invited to speak at the most recent UN Climate talks in Katowice, Poland, and in late January, she participated in a panel at the World Economic Forum (WEC) in Davos, which included U2 frontman Bono, acclaimed conservationist Jane Goodall, and the UN climate chief Christiana Figueres. 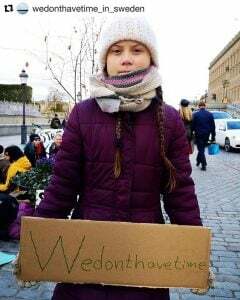 Inspiring as the example of Greta Thunberg may be – she also happens to be on the autism spectrum – questions arise as to how exactly one teenaged girl managed to attract so much international attention to her cause, with a humble action outside the Swedish parliament. Global Research audiences are well aware of how simple it is to dismiss and ignore people with narratives that threaten the powerful (think about challenges to the official stories about the White Helmets in Syria, Russia-Gate, 9/11, Venezuela’s ‘dictatorial’ president, etc). It should literally have been child’s play to sabotage Greta long before her campaign had a chance to touch the minds and hearts of millions. Is there more to the story of the rise of Greta Thunberg? Investigative journalist Cory Morningstar, encouraged by this broadcaster, looked into the background of the young environmental crusader and revealed some rather concerning details about convergences with major players in the international environmental NGO arena. The result of her research is a comprehensive series of articles entitled The Manufacturing of Greta Thunberg – For Consent. This four part essay, (part 4 is to be posted on or around February 3rd) exposes the involvement of a technology firm called We Don’t Have Time, which was pivotal in launching Greta’s online presence to viral status. Cory also outlines how Non-Governmental Organizations like AVAAZ, aligned with imperial interests and powerful figures like Bill Gates and Al Gore have been engineering climate solutions and climate activism for years. She argues that well-intentioned youth activists are helping to manufacture the demand for a program which will further assault the world’s most marginalized peoples, and devastate rather than heal a degraded planet. On this week’s episode of the Global Research News Hour, we host a special in-depth conversation with Cory examining her research into Greta Thunberg’s background, the problems with carbon offsets, Carbon Capture and Storage, and other proposed climate solutions, and the figures manipulating the climate movement from behind the scenes to the benefit of the world’s financial elite, not the planet. One important note: none of the criticisms registered in Morningstar’s articles or on this radio show should be interpreted as ‘climate change denial.’ Both the guest and the host acknowledge the science of abrupt climate disruption and recognize global warming as a serious threat to the near term survival of the human species, and possibly all life on Earth. It is the clandestine manipulation and exploitation of these legitimate concerns by the rich and powerful to promote questionable, self-serving solutions that is coming under scrutiny in Morningstar’s series and on this hour-long radio program. Cory Morningstar is an independent investigative journalist, writer and environmental activist, focusing on global ecological collapse and political analysis of the non-profit industrial complex. Her recent writings can be found on Wrong Kind of Green, The Art of Annihilation, and Counterpunch. Her writing has also been published by Bolivia Rising and Cambio, the official newspaper of the Plurinational State of Bolivia. Her series, The Manufaturing of Greta Thunberg – For Consent is posted at Wrong Kind of Green and at her site The Art of Annihilation. She lives in London, Ontario, Canada.